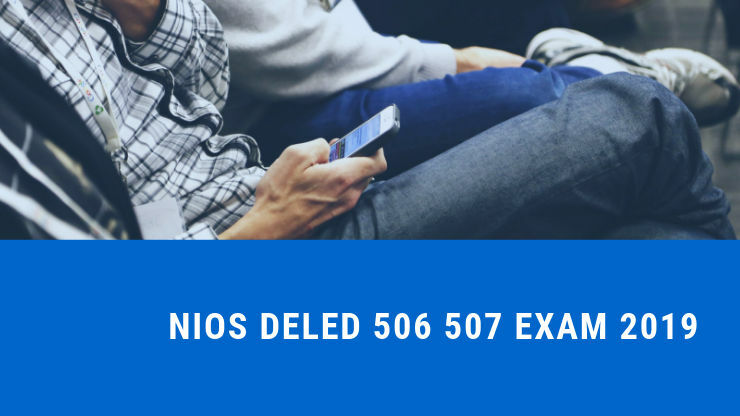 NIOS DELED 506 507 exam 2018 has to be done again. in the state of West Bengal. Due to the paper leak examination got canceled. Third-semester NIOS DELED examination (506 and 507) is going to re-conduct in West Bengal state on 3rd of February 2019. There will be two papers of DELED courses which are 506 and 507. If you are doing DELED (In-service untrained teacher) from NIOS then see the date sheet of re-examination of 506 and 507 in West Bengal. NIOS has conducted the DELED 506 and 507 Course Examinations for untrained in-service teachers on 20th and 21st December 2018. In this examination conducted across the country about 12 lakh + Apprentice teachers joined. The examination has taken from 2 pm to evening till 5 p.m. It was known that this examination was the third semester for the second year of DELED. The question paper in West Bengal was leaked before the examination on December 20 and 21. When this was brought to the notice of NIOS, NIOS canceled the examination. After filed a police report of the incident of the paper leak this incident was found to be true later. NIOS has confirmed this also by the State Officials of NIOS. NIOS has canceled the examination of 506 and 507 in view of this. NIOS has issued a public notice and has informed that all those trainees who have been examined from West Bengal will have to give the exam again but they do not have to fill the form again and neither to fill the test fees again. You will be given NOTIFICATION of RE-EXAMINATION at least seven days before and you will again be given the course 506 and 507 examinations for your prescribed center. And finally, you can now download the hall ticket or intimation letter for NIOS deled 506 507 re-examinations in West Bengal. Download the hall ticket here. There is no need to intimidate the trainees of any state other than West Bengal. This incident is only from West Bengal and only this state will be affected by it. For the trainees of other states, the examination results of 506 and 507 issued on time. If you want to see the results of 506 and 507, then there is a link available on this website. Click here to see results. NIOS has also issued a Datasheet for the course 508 509 or 510 and the examination will be held in March 2019. All trainees should maintain focus on the forthcoming exam. If you have any feedback or suggestions related to this post, then please write to us in the comment box below.